Lethal War Zone, by developer Fire Victory, is a surprisingly deep real-time-strategy game in the tradition of such classics as Command and Conquer. You’ll build a base, train and upgrade units, and do battle with enemy armies. Before waging war, you’ll select an advantage in either “Air” or “Ground” technology, which will determine your army’s strengths. 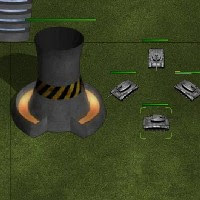 The game can be played entirely with the mouse, and you can drag-and-draw around multiple units to issue group commands. You also have the ability to assign these unit groups to hotkeys, for quicker access. There are an impressive number of structures you can create, and each plays a specific role. Provided that you’ve obtained an adequate stream of resources, you can build power plants, machine factories, airports, communication towers, and more. Between missions, additional unit types can (and should) be purchased to expand the effectiveness of your fighting force. As with many RTS games, certain buildings and units have prerequisites that must be met before they can be purchased. The presentation is a mixed bag. The interface is clean, and the playing field, units, and structures have a minimalist look to them. Path-finding is also a bit suspect (especially during combat), but the gameplay is mostly solid. Despite the graphical shortcomings, you’ll probably find yourself hooked after just a couple of (eleven available) missions. There’s a lot of game here, but you can save your campaign progress before every new mission. Fun, free, and well-constructed RTS games don’t come along very often. That being the case, I highly recommend giving Lethal War Zone a shot.